"Some of the most exciting and desirable objects of any style or period were displayed in the small boxes designed by cabinetmakers and the like. 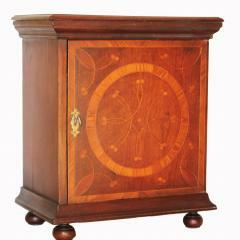 Below are examples of boxes that range from nicely painted period pieces to exceptional spice boxes. If there is a box you are looking for and do not see, please call or email, we may not have cataloged it yet." 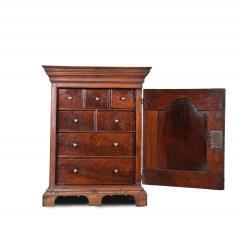 Wonderful Pennsylvania Chippendale double door spice box with arched flat panels on the doors very nice old patina and terminating in Ogee feet. 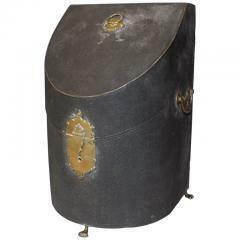 Very rare wood, Iron and sharkskin domed casket on ball feet. Ornamented with iron strap work and double hasp lock. Silk damask interior. Very rare miniature brass casket. Wonderfully engraved with birds a goat, rabbit and snail with floral designs. 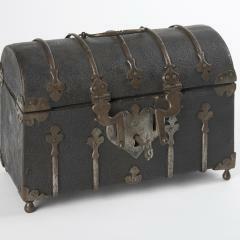 His boxes are typically engraved with figures and faces making this one unique. 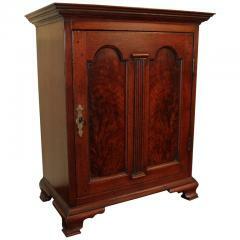 A very calming walnut chippendale spice box. Double arched panels on the door. Very nice drawer arrangement inside with Ogee feet. Extremely rare walnut line and berry Wm. and Mary period spice box. Dart board design on the door. Bold cornice and base molding. 11 small drawers inside. 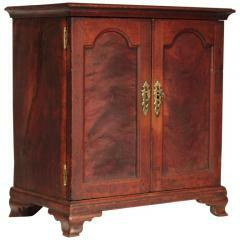 Along with the line and berry inlay and herringbone inlay are the initials "A S". 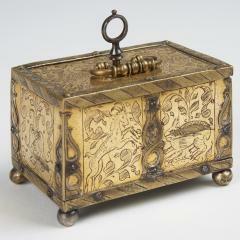 These inlaid spice boxes are extremly rare and desirable. We are specialist in this type of inlay and have incorporated it in our logo since 1982. 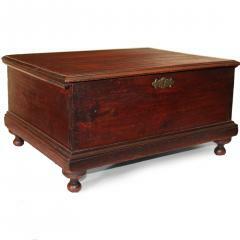 This Walnut Queen Anne Bible box has a thumb molded edge, engraved escutcheon and turned feet. A charming and engaging box with molded lid fronted by a mirror with ogival ends. The molded base is supported on ogee bracket feet. 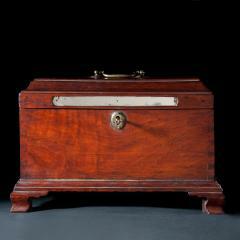 The box features a wonderful amber patina and still retains the original bail handle. Provenance: Ex. collection of Israel Sack. 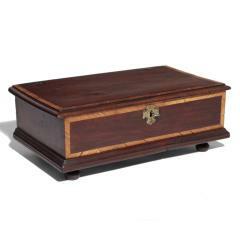 This bible box has a stepped, molded top, herringbone inlay, engraved escutcheon, molded base and ball feet.